Leonid Lebedev (lead image, centre), a Russian oil and electricity trader and patron of Cyprus President Nikos Anastasiades (right), is set to lose his multi-billion-dollar claim for a stake in the sale of TNK-BP to Rosneft, according to papers released by the New York State Supreme Court. The Rosneft deal, priced in March 2013 at $55 billion, created Russia’s dominant oil producer, and one of the world’s most valuable petroleum companies by revenue and market capitalization. Its current market value is Rb4.4 trillion ($66 billion). Lebedev has been claiming in the New York court since 2014 that he is owed $2 billion for a 15% share he once held in the Russian oil company, Tyumenneftegas (Tyumen Oil Company); TNK was the Russian acronym until British Petroleum bought into the company and it became TNK-BP between 2003 and 2013. Lebedev has sued Victor Vekselberg and Len Blavatnik, alleging that their agreement for the sale of his shareholding for $600 million between 2001 and 2003 had not been completed or paid up. Vekselberg, who is Russian, and Blavatnik, Anglo-American, say they paid Lebedev his money, and that he has been lying and fabricating evidence ever since. In a hearing held by Judge Salliann Scarpulla on November 14, but kept sealed until a month ago, the judge strongly hinted that she will not allow the case go to trial. She has already dismissed Lebedev’s claims of fraud and deceit by Vekselberg and Blavatnik. 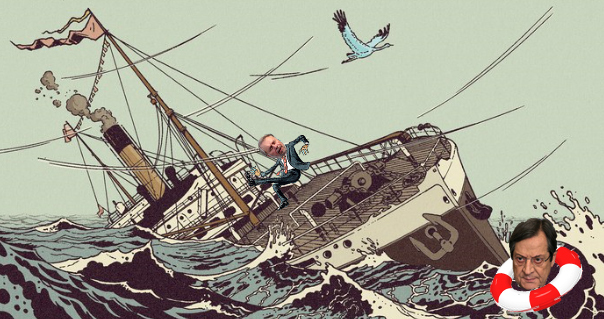 That left Lebedev’s claim for breach of the sale contract. Scarpulla told lawyers arguing Lebedev’s case that she didn’t believe he had not agreed to the $600 million sale through the Cyprus-based company he had created to act his agent, Coral Petroleum. After concealing Coral Petroleum’s bank transaction records and accounting records for years, they were discovered last year at BNP-Paribas. Lebedev started his court case in New York in February 2014. He then amended his claims in a second filing in October of that year. Lebedev chose the court in Manhattan because, he argued, Vekselberg and Blavatnik had business in the city; that Vekselberg used to live the state; and that negotiations on their deal had taken place in walks around Central Park. Vekselberg was hit by US Treasury sanctions last April. Lebedev fled Russia in 2014 as Russian prosecutors intensified an investigation of alleged fraud and embezzlement of up to $240 million from TGK-2 and TKS, associated regional electricity producers and distributors which Lebedev controlled through Cyprus front-companies. Lebedev has obtained US Government protection and divided his time between his bank accounts in New York, a home in Los Angeles, and another home in Limassol. If he loses the New York court case, Lebedev is at risk of a court order to pay millions of dollars in costs for Vekselberg and Blavatnik. For more details of the Lebedev case, read this. For the full archive, click to follow. In Cyprus Lebedev and Anastasiades were business partners when Anastasiades was running the Limassol-based law firm which his family continues to run. 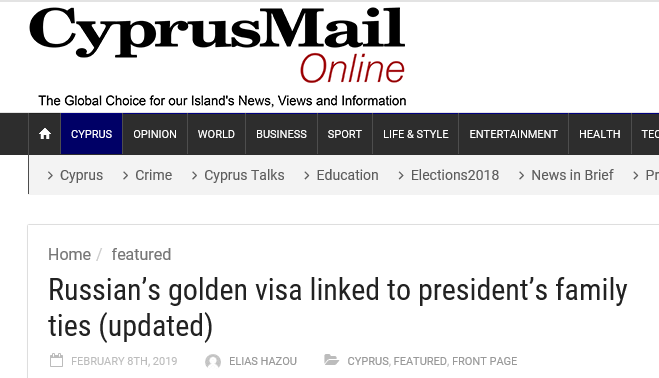 That firm, it was revealed in Cyprus this month, has been a major operator of the sale of Cyprus (European Union) passports to wealthy foreigners seeking safe haven. Lebedev bought his Cyprus passport in 2011, but failed to reveal it in Russia where he was a senator in the Federation Council, and was prohibited from holding dual nationality. Lebedev also lied in a Cyprus court about his nationality when trying to avoid a German bank claim for recovery of $180 million in loan money. Lebedev has continued to meet with the Cyprus director of Coral Petroleum, Theofanis Philippou. He remains at the Anastasiades law firm where he is managing partner. Philippou refuses to answer questions about his relationship with Lebedev. His Twitter account, by contrast, is very talkative, promoting the sale of luxury cars and watches, and Philippou’s connection to Anastasiades. Anastasiades has said through a spokesman that the Lebedev case against Vekselberg and Blavatnik “has nothing to do with him personally” — note the adverbial qualifier. “The president is not implicated in this case. Conceivably, the law firm might be implicated,” the presidential spokesman added. Corruption allegations have dogged Anastasiades during his first election campaign in 2012-2013, and again during his second campaign in 2017-2018; he won both in runoffs against the Communist Party (AKEL) candidate, though his majority has been slipping. Cyprus sources also claim that Anastasiades has continued to meet Lebedev after his election as president. It has been speculated that Lebedev’s relationship with Anastasiades was one of the pressure points US officials have been applying in secret on the Cyprus President. For details of US State Department plan to persuade Anastasiades to agree to permanent basing of the Turkish invasion force on Cyprus – they first occupied northern Cyprus in 1974 — under a NATO flag, read this. 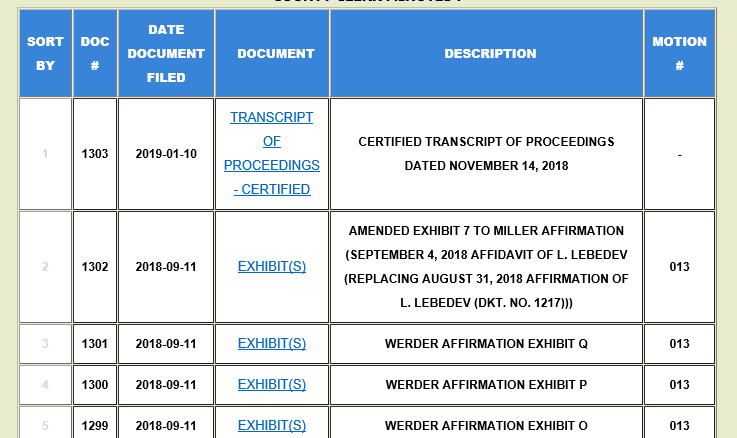 The New York court hearing transcript is the latest item in the court docket. Judge Scarpulla is now in her third month of preparation of her judgement on the case. The New York Supreme Court makes accessible the case file, starting here at the SCROLL system. The Lebedev case can be viewed by entering the index number 650369(2014). Scarpulla’s ruling on whether Lebedev is kicked out of court is due soon.